The question P. Allen Smith gets asked most during his travels is “Do you actually live on Moss Mountain Farm?” Well ask no more because this episode aims to put that question to rest. Allen invites us into his home and shows us some of his favorite areas of the farm. He also answers the 2nd most asked question… “Where can I get your Buttermilk Pecan Pie recipe?” If you’ve watched the Garden Home Retreat being built, then you’ll love this episode showing off the gardens and house. Nobody can do everything, but everyone can do something. That’s the theme of this episode. Watch as P. Allen Smith talks to people making a difference in their communities and also the world. From growing food for the homeless, teaching kids in the garden, composting, to creating new organic plant varieties. Watch “Making a Difference” and maybe you will be inspired to make a difference too. Mini is the new black! We’re shrinking everything, including P. Allen Smith for this fun episode. Mini plants, mini houses, mini pizzas— it’s all mini, including the fairy gardens craze that is currently sweeping the nation. With more and more people doing “Stay-Cations” it makes sense to put a little time and effort into your outdoor living space. A little grilling, a little relaxing and a few chickens. Come on… Did you really think P. Allen Smith would do a show about embracing the backyard and NOT have chickens? Did you know the American Institute of Stress says 80% of workers feel stress on the job and nearly half of all workers say they need help learning how to manage stress? Never fear. Escape to the garden with P. Allen Smith as he shares his garden stress relievers including yoga poses specifically designed for gardeners. We grow accustomed to things we see every day, the things we’re comfortable with. But it’s a good exercise to go beyond our comfort zones and explore things that are a little unusual. From unique planters, obscure wall hangings or a pizza topped with a fried egg, this episode explores the uncommon and unconventional. Kids and broccoli aren’t traditionally a match, but studies show that if you teach children how to grow vegetables, they are more likely to eat it. Learning about their food sources will also lead to healthier lifestyles as they grow up. That’s why P. Allen Smith is a big advocate of getting kids in the garden. Plus, meet some kids who are raising chickens in the city and learn how to design a kids room that easily adapts to their changing styles. Small spaces can be a challenge to make comfortable and stylish but P. Allen Smith has some ideas you can use for any area, indoors or out. Watch as Allen offers suggestions to a helpless romantic in setting up a spa getaway for his wife. Plus, we’ll travel to New York City and see how one designer has created a beautiful garden on her balcony. No matter what the size of your space, there’s always a creative solution. Getting started on a gardening or decorating project can be intimidating to some people if you don’t know where to begin. That’s ok, because today P. Allen Smith is going to hold your hand and help you through every step. We’ll learn the top five, first-time gardener mistakes, see someone with a black thumb turn it green and understand when it’s time to call in reinforcements. This episode is all about flowers and how they have the power to lift our spirits and add personality to our homes. P. Allen Smith shows us how to grow some of his favorites for arrangements and how to let loose and not try to be so perfect in the garden. Step back in time with P. Allen Smith as he travels back to 18th century Williamsburg to see just how George Washington and other Virginians would have lived (and eaten) in Pre-Revolutionary War time. He’ll walk in the shoes of an 18th century middling to meet some colorful characters that talk about the gardens, kitchens and their way of life. You’ll even get a taste of our first president’s favorite dish. Look up in the sky… it’s a bird, it’s a plane… nope. It’s an episode of Garden Home all about extremes! Today P. Allen Smith covers both ends of the spectrum. Topics range from plants that love the heat to plants that thrive in water. We’ll also see some extreme decorating ideas that feel right at home in the Garden Home Cottage. Learning some self-defense is a good idea for everyone. 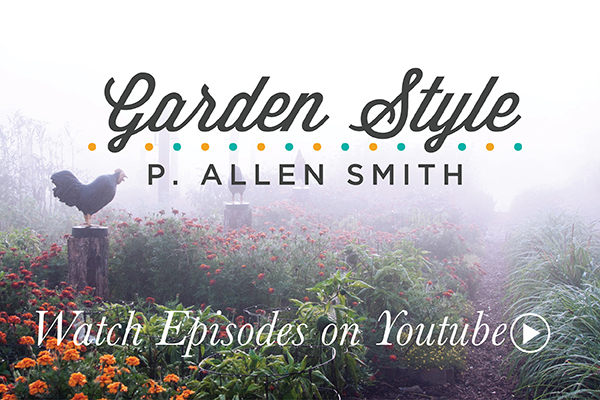 In this episode, P. Allen Smith will explore some fighting moves you can do to protect things around your home and garden. Now don’t worry, these moves are all natural and a few are also very effective in case of a Zombie Apocalypse.